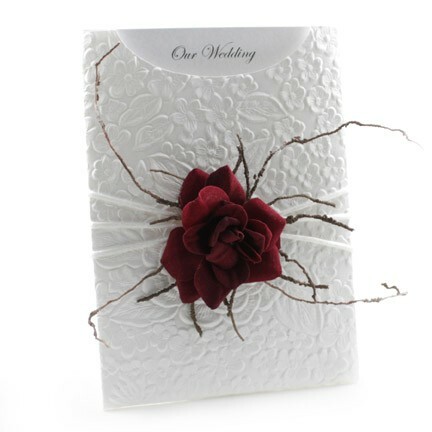 This beautiful wedding invitation features our exclusive C6 Glamour Pocket® in a matte white embossed rose design. It is then decorated with a lovely big red velvet rose, white china knot ribbon and some vine twig. The insert is in the famous Curious Metallics Ice Gold 250gsm card and simply slides out to reveal your special announcement. you will need the following Paperglitz Products. 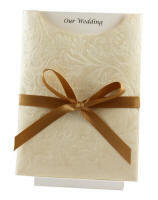 * Vine twig can be supplied by most wedding invitation retailers or florist suppliers. Vine twig is not available from Paperglitz. 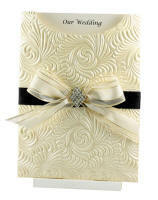 Matching accessories such as place cards, RSVP Cards, Invitation Boxes, Order of Service Covers etc are also available. Be sure to discuss your requirements with our stockists. Want to customise this design? Talk to our stockists today! This invitation may be pictured on our Card Stands - sold separately. and ask them to contact us about becoming a stockist today! ® Glamour Pocket, Add A Pocket & The Paperglitz Logo are all Registered Trademarks of B M G Marketing Pty Ltd (trading as Paperglitz).